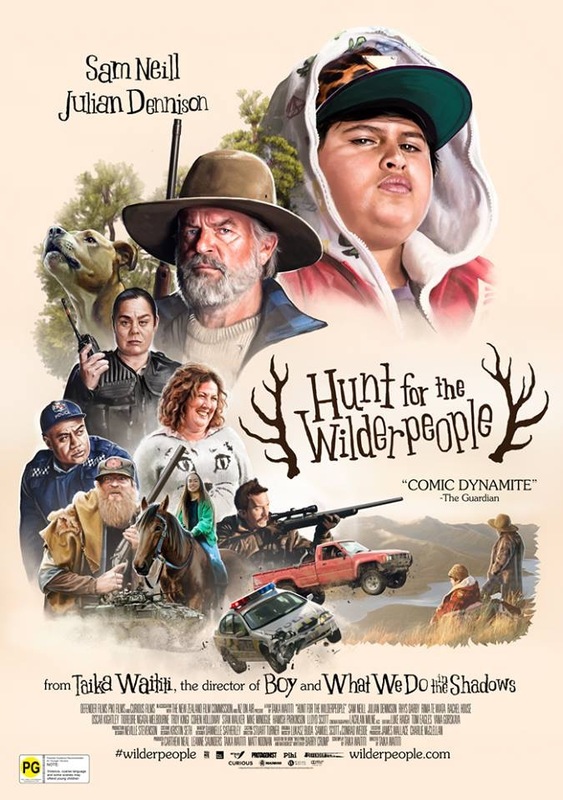 Starring: Julian Dennison, Sam Neill, Rima Te Wiata, Rachel House, Tioreore Ngatai-Melbourne, Oscar Kightley, Stan Walker, Mike Minogue, Cohen Holloway, Rhys Darby, Troy Kingi, Taika Waititi. After the hilarious vampire comedy, What We Do In The Shadows in 2014, there was much anticipation for Taika Waititi’s next film. Hunt For the Wilderpeople has now arrived and arrived to yet more critical acclaim. The positivity surrounding it, however, has also been its slight undoing for me. It’s an admirable little adventure but it didn’t quite strike the chord that I was expecting. Plot: Ricky Baker (Julian Dennison) is a young delinquent sent to live with his Aunt Bella (Rima Te Wiata) and Uncle Hec (Sam Neill) on their remote farm. But when his aunt passes away, child welfare want to relocate Ricky. This forces him and his Uncle to go on the run throughout the New Zealand bush as a national manhunt is ordered to capture them. Despite the dark edge to What We Do In The Shadows, Waititi’s deftness was in finding a lighter tone and cleverly tapping into vampire folklore to provide the laughs. It was a playful and kind-hearted satire that hit all the right notes. With Hunt For the Wilderpeople, he, once again, displays a kind hearted nature and taps into the angle of a pair of mis-matched misfits on a journey of self-discovery. Amiable as it is, though, it just doesn’t have the laughs that made his previous film so successful. That’s not to say, that this film isn’t an enjoyable experience as it still has plenty going for it. 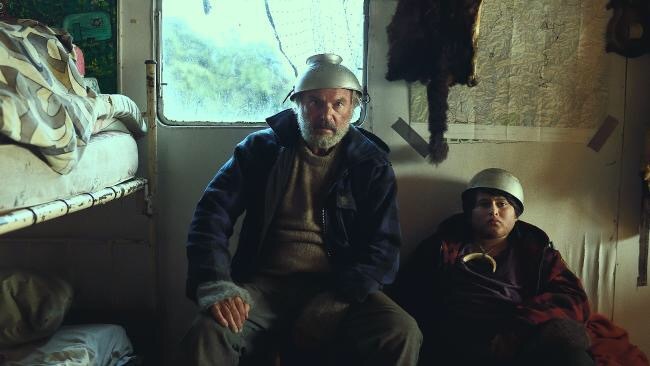 For a start, the two leads in Sam Neill and young Julian Dennison are an absolute treat. Their camaraderie and wit is infectious and they both embrace their characters with a genuine sentimentality. Neill’s surly old codger and Dennison’s haiku writing, wannabe rapper are a joy to watch and they’re given fine support in the early part of the film by the hugely enjoyable Rima Te Wiata – who was so good in the comedy/horror Housebound. It’s the characters and their quirky humour that Waititi captures very well but it was, sadly, the narrative (based on Barry Crump’s novel) that I didn’t find as engaging as it could’ve been. It’s a pleasant journey with a fine balance of humour and pathos but, to be quite honest, I found it became rather lethargic and overstayed its welcome. Waititi tries to inject a quicker pace with some action in the final third – which is unashamedly reminiscent of Thelma & Louise – but it feels misjudged and out of place. However, fans of the Thor franchise might take some reassurance from Waititi being selected for the next instalment as he showcases his ability to stage bigger scenes. Without question, though, Waititi’s film looks beautiful and his picturesque New Zealand locations are quite stunning and he makes fitting use of music throughout. In a different frame of mind, I think I could’ve enjoyed Hunt For the Wilderpeople more than I did. It’s one of those films were my expectations were so high, that it was always going to be a stretch to meet my demands. There’s some impressive work on show but, ultimately, this is nothing more than a delightful little adventure that encourages a mild chuckle rather than belly laughs. Trivia: Sam Neill’s Uncle Hec is portrayed as an illiterate but in real life Neill has a BA in English Literature. This entry was posted on December 22, 2016 at 6:55 am and is filed under Adventure, Comedy, Drama with tags 2016. You can follow any responses to this entry through the RSS 2.0 feed. You can leave a response, or trackback from your own site. Refreshing to see a more cautious review on Taika Waititi’s new film. The hype for this really has gotten quite to a level of saturation for me too, I have to say. But dammit I still cannot wait to see this. I still feel desperately behind on this! But I bet this will be similar for me. I do not see how he can match or even quite approach the genius that was WWDITS. That thing was awesome. That was exactly my feelings, man. I had the same expectations and drive for this flick because of WWDITS. I loved that flick. This is not the same. If you go into it with less expectations then it might work but, for me, this is is a different deal. And a deal that left me deflated. Decent, but not great, as the critics have hailed it to be. I’m in the “I loved it” camp. I was impressed with several things about it. I won’t rehash my review, but I love Waititi’s unique sense of humor which can be chuckles or big laughs. But what really surprised me was the heart this thing had. Wasn’t really expecting it. I enjoyed it, man. It was pleasant but if, truth be told, I had higher expectations. I went into this expecting belly laughs (like I had with What We Do in the Shadows). Granted, that film is an exceptional piece of comedy but the anticipation was still there. Unfortunately, this one didn’t quite cut it for me. I liked it but it very, very mild. Hello mate, I hope all is good with you. I felt exactly the same way about this one; given the praise it has received I expected something special, and although it elicited a few chuckles here and there I just thought it was ‘OK’, and nothing more. I liked the performances but was expecting a funnier screenplay. I totally hear you on this flick, though. It was fine. Just fine, though. Nothing more. I had very high hopes on this one and it simply didn’t reach the heights that I expected from it. Mild chuckles were about all I took from it. I’ve seen much better from this type material and I can’t quite fathom the extremely high praise it’s been receiving. I’ve gave it 3.5 but, to be fair, I don’t even think it deserves that. Ah that doesn’t sound too good, man, but my best to you all the same and I hope things work out/get better, etc. Cheers bud. I’ll be back in the swing of things soon enough. Hope your Xmas went well and a happy new year to you! It felt like a YA film with hints of Wes Anderson in it (dark comedic lunacy that he does so well). Here, though, it got ridiculous toward the end. It was great to see Sam Neill doing well in it and the setting lush and great. The boy, however, didn’t do much for me. Some people loved it; I am in the well-okay-it’s-charming-in-parts-category. Hey Cindy! Im in total agreement. I might have given it 3.5 stars but that’s at an absolute stretch. It was endearing enough that it led me to that rating but it didn’t offer anything else other than endearment. The story was kinda formulaic and the laughs were few and far between. I too thought it got ridiculous. The whole Thelma & Louise scenario just didn’t work and at that point the film lost any respect I had. Now that I’m thinking, I shouldn’t even have bothered with a 3.5 rating. It doesn’t deserve it! Ach well. Many people thoroughly loved it. That they did. But I struggle to see why. It’s nothing more than light entertainment. I can totally understand what you mean about a lot of hype surrounding a film. Sometimes it is genuinely merited by the movie itself, but in others it can be the undoing and you can feel deflated by what you see. That’s kinda what I was left with here, Vinnie. It’s a pleasant film and decent enough but it’s not quite the film the critics have raving about. It can be quite a let down when some movies get way over hyped. Hey Buddy! Took a little hiatus from blogging but easing my way back in. Lots of people seemed to really respond to this one. I thought it was ok. But I was expecting a lot more from it. That said, it’s still a pleasant little film. Yeah, been pretty lax blogging wise over the past few months. Will try to do better in 2017! Same here, man. Life got in the way a bit. I’ve still got a backlog of reviews that I done and just never posted. I really enjoyed this film, very Kiwi and even living here was not that aware there was massive hype beforehand. It will be interesting to see what Taika does with the new Thor movie. It was decent little flick. I liked it but I, admittedly, executed more. I think I got caught up in the hype. Shadows was outstanding for me. By far, one of the most hilarious comedies I’ve seen for years. Probably since The Big Lebowski. I loved Shadows. Just loved it!